In My Kid’s College Costs will be $467,000! Are You Kidding Me?, I may have gone too far toward the worst case scenario. 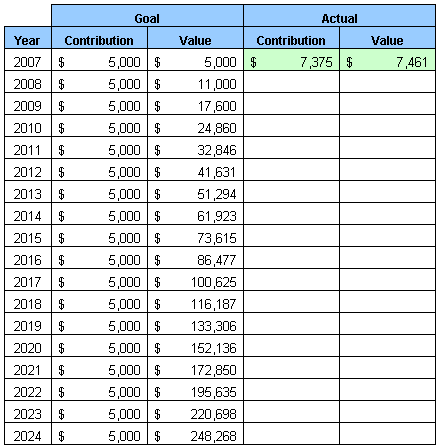 After additional research at Savingforcollege.com, a more realistic number should be around $250,000 for 2024. Although I have not decided on the exact investment vehicle, I am leaning toward the New York’s 529 College Savings Plan. In the future, I will come back to this plan and adjust it if needed. June 6, 2013 – Saved $47,050. Right on track! June 7, 2011 – Saved $27,500 so far (slightly behind schedule, but these past few years have been tough on the Stock Market). October 1, 2009 – We moved to Virginia, paused the NY Plan, and started the Virginia 529 Plan. October 12, 2007 – We started a New York’s 529 College Savings Plan for our son. My Kid’s College Costs will be $467,000! Are You Kidding Me? I’m really glad to see your blog and the blogs linked to your site.. I found it as I was trying to invest for education for my 3 yr old son. Have been reading other links from then on.. Please keep up the good work.. and thank you. It would be great if you could update plan for your son’s education. These days with nothing fetching a good return, how do you suggest to proceed. Yowza- you’re saving over $600 per month just on your kid’s college? Either you make a TON of cash to be able to sock that away, or you’re damn good with money. Either way, great job on exceeding your goal last year. @Llama Money — I am not sure how you got to $600, but I contribute $425 a month to his 529 plan. I don’t make a lot of money, but I take savings very seriously. $7375 / 12 months = $614.58. Thats a lot of money for their education. How many kids do you have? I think its real nice that you are going to pay for your kids college (I have to pay for my own). Just make sure you teach them through other methods the value of a dollar. I have a lot of friends who don’t take their parents money seriously and waste their time at college. Make sure they are great full for this huge gift you are giving them. They are not owed it. @David — that’s an estimate for 1 child going to 4 years public college 17 years from now. It’s mind blowing. I am definitely going to teach my kid(s) to be responsible with money. I am like your friends — I didn’t appreciate what my parents gave me when I was going to school. I spent a lot of money and didn’t pay enough attention in class. Is the 529 the best plan for our newborn if we are not sure she will attend an in-state college? We live in Indiana but may to a different state. Thanks. @Wendy – You will have to read each plan carefully. Some plans are very flexible and allow you to use the fund anywhere — i.e., with NY plan, I am not limited to NYS schools. Yea, my mother bought 2 529s for my 2 kids last year in MT, and they’ve really done nothing exciting, but one of my goals is to look into the options this year on what I can do to further them – have you heard if you can transfer 529s between state programs? @hank – I think that having the plan under your mother’s name might be an even better way to do it, because the savings is not considered in financial aid calculation at all. If your plan is not that great, you may transfer it to another 529 plan; however, you have to read the fine print because some plans impose a penalty when you do so. Where do you reliably get a 10% return on investment every year? I think you are gambling the numbers. So basically you’re gambling with your kids education. @Fubek – that’s a good question. I hope the post, “Introduction to CAGR” will answer your question. If not, we can discuss this further. Thank you for your comment. Great plan! I envy your organization! !